Sometimes free Praxis Core reading practice tests online aren’t your greatest option. After all, what happens when you have real-time Praxis Core Academic Skills for Educators Reading practice test questions that you just can’t find the answer to in your books? What if you have a hard time motivating yourself to do your Praxis Core Academic Skills for Educators test preparation? And what if you can’t afford to study with an expert tutor or prep course to help strengthen your content areas? Praxis Core Reading study sessions with other test takers help you develop the content mastery required to pass. After all, your fellow peers can give you motivation and encouragement that you might not get from a free Praxis Core practice test pdf or download online. Plain old group Praxis Core Reading study sessions can be powerful and innovative. In highly productive sessions, you can practically feel your test score blasting through the roof. Whether you’re getting together with a couple of future certified teachers or are planning group sessions with your class, here are the top-notch Praxis Core Reading practice strategies that will get you closer to a classroom of your very own! You can also apply it when taking a Praxis Core Math practice test or studying for the Writing Test. Large group Praxis Core Reading Test prep sessions can be great once or twice a week. However, one-on-one Praxis Core study sessions are tremendously more effective in raising your score. Here’s a can’t miss tip: instead of pairing off with a good friend, meet with a peer who performs stronger in a content area that you’re weak in. For example, if you have a hard time with reading comprehension questions, meet with someone who’s already taking this exam or are weeks ahead of you in their test preparation. It’s a great way to get the best of both group and solo study! Give your group Praxis Core Reading practice sessions structure. Have each participant present on specific content areas of your Praxis Core preparation materials. For example, one group member can give a 20-minute presentation on how to recognize trick questions, while another member can talk about how to quickly choose the best selected-response answer. One of the really great things about Praxis Core Academic Skills for Educators study group sessions is that you can simulate the closest experience to the real exam as possible. Schedule a test session together and make it as realistic as possible. Not only will you become familiar with how the day of the actual exam will run – but you’ll get a significant confidence boost that will make your actual test seem like a breeze! 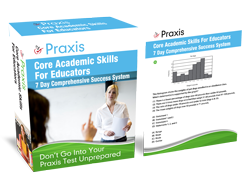 Isn’t It Time You Passed Your Praxis Core Academic Skills For Educators Reading Test? You know that you’re ready to run a classroom of your very own. After all, it’s been a dream of yours for years. So don’t let Praxis Core Academic Skills for Educators stand in the way of you and your teaching career dreams. "Why Not Pass The Praxis Core Academic Skills For Educators Now and Tell Your Own Success Story?" It actually covers the real Praxis Core! FREE Praxis Core practice questions (just like the exam). By licensed teachers who passed. Get FREE Praxis Core Study Guide Now!